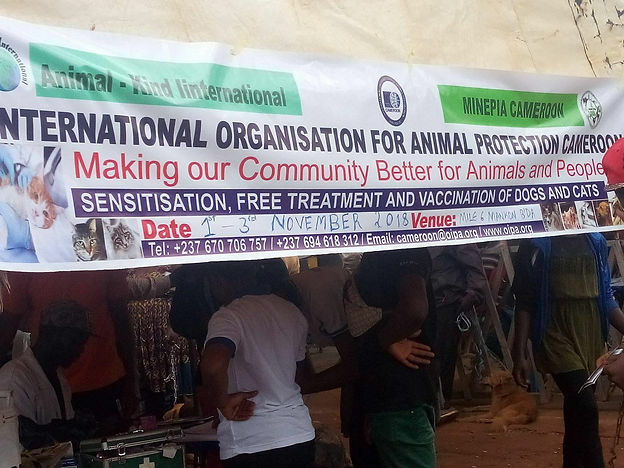 OIPA-Cameroon received one of eight Africa-Based Animal Welfare Organization grants awarded by AKI during 2018. This is OIPA-Cameroon’s report about how they used AKI grant funds. 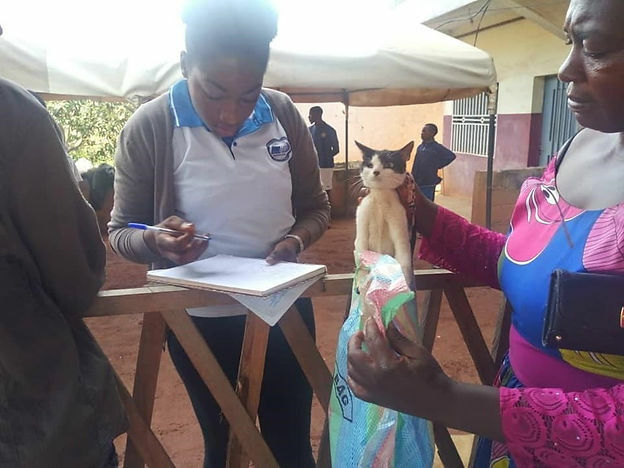 Animal welfare education and protection in Cameroonian rural communities is rare, and this is the reason that community streets are increasingly filled with stray animals. 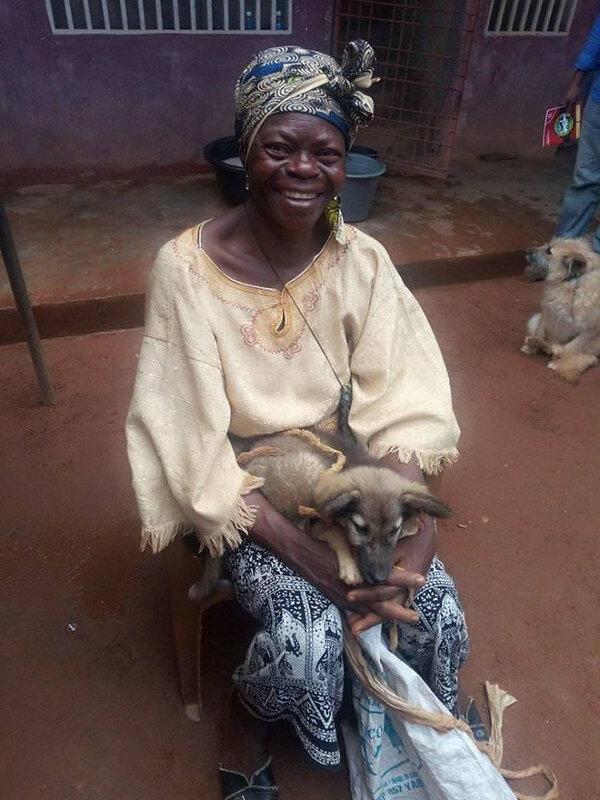 To address the negative attitudes about dogs and cats and to raise awareness about the responsibilities of pet ownership, OIPA launched a Responsible Dog Ownership campaign in collaboration with Cameroon’s Ministry of Livestock, Fisheries, and Animal Industries (MINEPIA) and funded by Animal-Kind International (AKI). 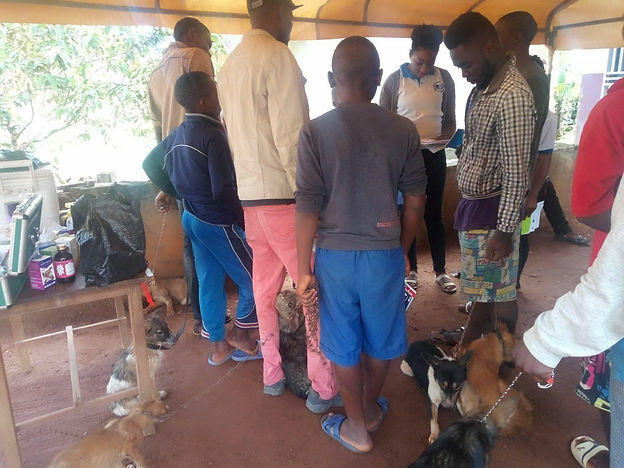 The campaign aimed to promote and encourage responsible dog ownership in a rural community in the North West region of Cameroon specifically, in Mankon community. 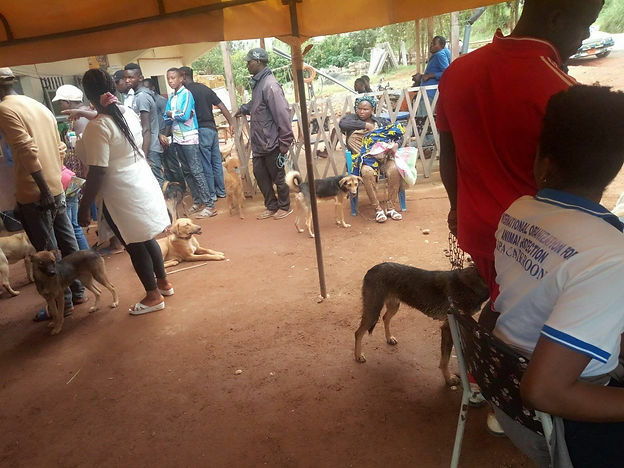 The three days campaign, which took place from the 1st – 3rd November 2018 at Mile 6 Makon under the theme “Making Our Community Better for Animals and People,” educated the community, especially dog owners, on animal welfare, care, and protection. This program also benefited pet owners as it enhanced their knowledge and relationships with their animals. We first advertised the campaign broadly and this caused many extremely anxious pet owners to flood the OIPA office with their pets even before the 1st November 2018 with their pets to be treated. 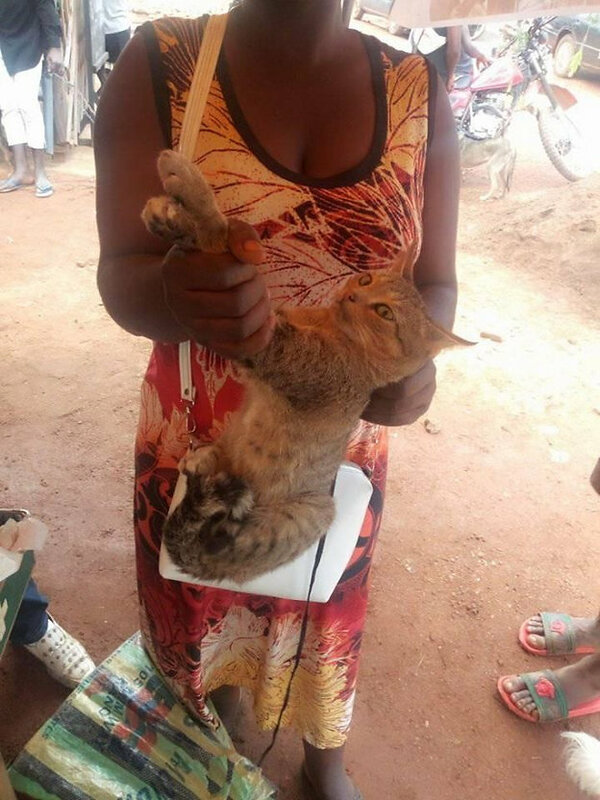 Thanks again to Animal-Kind International, we were able to treat some of the animals (like the one in the picture below) with the medicines that were brought with the grant from AKI. The campaign started off with sensitization within the mile 6 and mile 7 neighborhoods in Mankon. 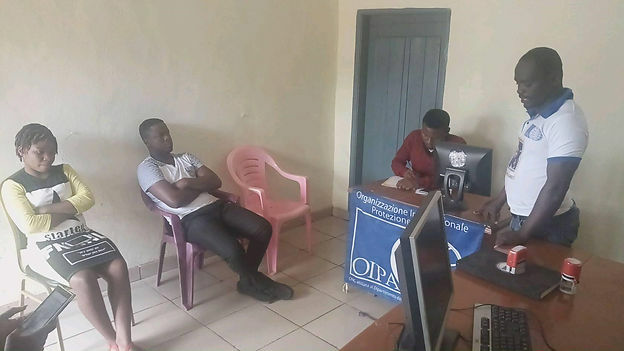 OIPA volunteers met with the quarter and village councils, schools, community and religious groups, and municipal authorities, and we informed them about the clinic. 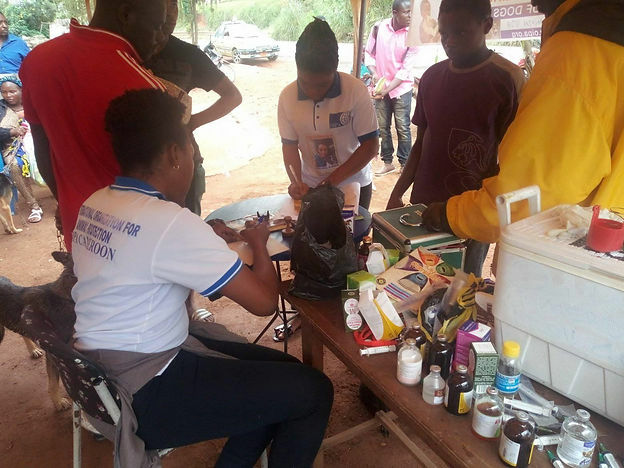 Materials such as banners, flyers, posters were given to the community to place at the vaccination points to inform the population about the campaign and its importance. We made announcements and gave talks in churches and community gatherings. On day two, sensitization continued as OIPA volunteers were dispatched to carry out a door-to-door campaign to better explain to the population about the treatment and vaccination campaign, its importance to animals and animal owners and how it will benefit not just the animals but also the owners and the community. Responses, especially from animal owners, was overwhelming. It is a rare opportunity said many of the owners of animals and they also thanked the team for taking time to educate them. Also, they promised to improve the condition of their dogs and to feed them on a daily basis. The bad news is that we identified over 27 stray dogs that really need medical attention but with limited means our team was unable to help. After retiring from the field, a meeting was held at the head office involving the OIPA team and the veterinary personnel from MINEPIA (picture below) in a bid to come up with a plan on how to carry out the mass treatment and vaccination project of dogs and cats scheduled for the 3rd November 2018. Day two was a huge success as both the team and vets were satisfied with the outcome of what was done in the field and at the meeting. On day three, a static point vaccination team stationed at mile 6 Mankon was set up and ready to treat 40 owned dogs/cats and 20 stray dogs. Those are the numbers we planned for. The day started off at 8:00 AM with a massive and amazing turn out. It was then that we realized the power of education and how ignorance has led to suffering of many dogs in rural communities. 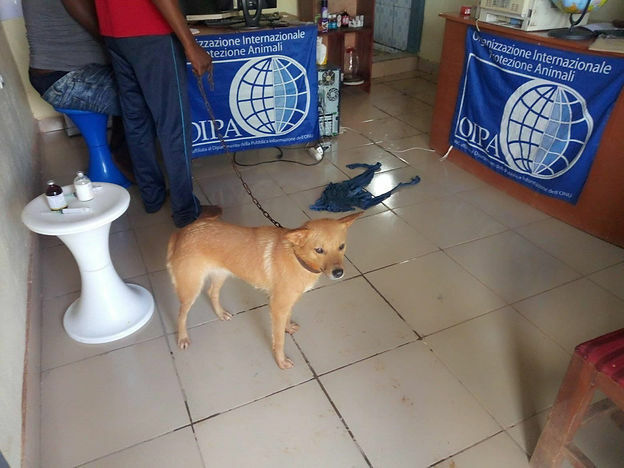 OIPA volunteers registered every dog upon arrival, taking into account basic information such as the owner’s name, contact, location, pet name, breed, and coat. They further interviewed owners on the health conditions, feeding habits, and general welfare of their pets (treatment area pictured below). This information was handed to the vets for consultation, treatment, and vaccination (picture below). 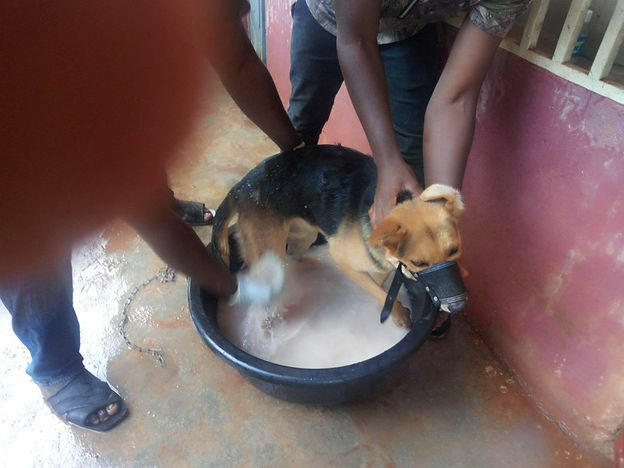 In an organized manner, the veterinarians, Mr. Simanmu Ivo Nocha and Mr. Sam Njela, under the strict supervision of OIPA’s country representative, Mr. Che Gilbert, and a representative from the MINEPIA), ensured the dogs wore a tape muzzle and then dipped the dogs in sterilized water (penstrape and Lekki boubi) to wash off ecto-parasites. This was then followed by the administration of antibiotics intramuscularly. 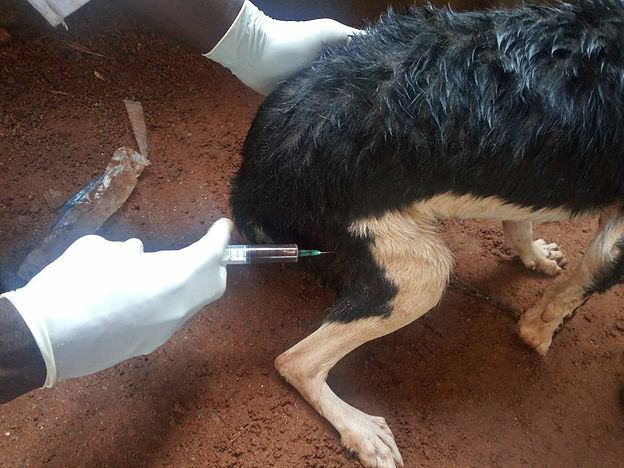 Some of the dogs were de-wormed in accordance with their respective diagnosis. It was observed that most pets suffered from bacterial infections, worm infestation, lack of appetite, ecto-parasites, and anemia. Physically some dogs had wounds on the ears, eyes, legs, while others looked pale and ill. Conversely, some looked healthier and their relationship with their owners left smiles on onlookers faces as they rolled and played. Drugs such as penstrep, ivermecten, multivitamin, deditech, dexamethasone, vitaflash, sundexa, sulphadimidine, kepro, and iron were administered to the pets. Pantex-oxytetra was sprayed on wounds, cuts, bruises, and above all, rabies vaccine was administered. This exercise went on and on as more pet owners approached the treatment point with their pets and applauded the initiative to free our communities from common canine and feline diseases. Cats were only vaccinated and a certificate of vaccination/treatment was issued to owners. Finally, at 4:30 PM, the treatment came to an end with light refreshment from OIPA Country Representative and departure. Unfortunately, 107 dogs went untreated and we do hope to get more support to be able to treat and vaccinate them and to continue our community education campaign. Below are more pictures of the pet owners and their pets at the clinic. 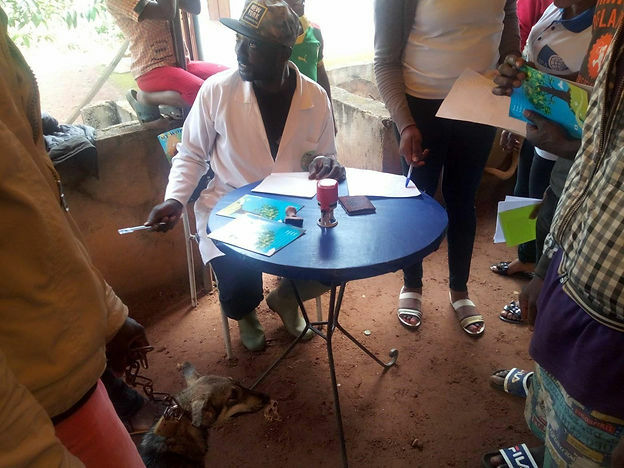 OIPA CAMEROON EXPERIENCED A SAD DAY DURING ITS VACCINATION CAMPAIGN IN THE BAFUT VILLAGE.